Every real car enthusiast likes it shiny and neat. And it is not all that important whether the brilliant paint is on their own or any other car in the showroom. A neat paint is simply a feast for the eyes. With the right paint maintenance product, it is also not at all difficult to visually brush up the paint of customers’ or exhibited cars and to protect it lastingly. 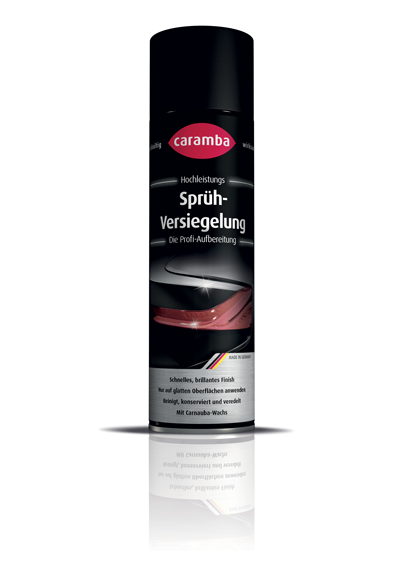 Using our high-performance spray sealer from Caramba, you can accomplish it – easily and highly effective. Time and again it happens that vehicles have to be prepared upon customer request or need to be polished for sales purposes. It is also not uncommon that car sellers themselves are faced with this task to present their offered vehicles appealingly in their showroom. That is why Caramba has a very special paint maintenance product on offer for commercial users. Our high-performance spray sealer containing Carnauba wax maintains, preserves and protects in a single pass and gives all smooth and painted surfaces, but also glass, chrome and smooth plastics a brilliant shine. Use this product that comes in convenient aerosol cans to give paint, glass panes, chromium plating a brilliant shine and to make your customers happy while protecting their vehicles against wind and weather. 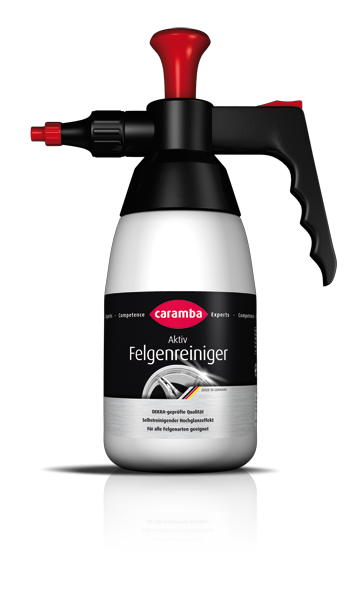 Caramba high-performance spray sealer is easy to use and shows its special visual effect immediately after its application. But at first major soiling, it has to be removed from the area to be treated. For more information on this topic, see our car preparation category. However, slight soiling such as fingerprints is automatically and easily removed by this sealing product. Then, spray this product sparingly and spread it using a sponge or microfibre cloth. Afterwards, use a dry cloth to repolish and to complete your paint maintenance. Always ensure good ventilation when using this product and avoid frost and excess heat. Use this paint spray to brush up cars and motorbikes – Caramba high-performance spray sealer.